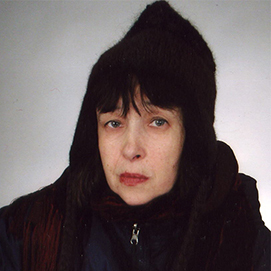 Elena Shvarts was born 1948 and was graduated from the Leningrad Institute of Theatre, Music, and Cinematography's department of theater criticism and scholarship. She became known in St. Petersburg underground circles while still a schoolgirl and eventually became active in Club 81, a highly influential group of younger writers and critics. Storony Sveta [Cardinal Points], her first book to appear in the Soviet Union, was published in 1989; by her own description, though, “Starting in 1978 a lot was published in emigre journals, and then three books came out: two collections of poetry, one with Russica in New York; one in Paris, with Beseda; and a novel in verse (sort of) with Ardis Publishers in Ann Arbor about the mad nun Lavinia.” Altogether she has published fourteen books, including thirteen books of poetry and one book of prose. The series “Autograph”” published by Pushkin Fund (Zvezda) includes four of these. Her collected poems have appeared as Stikhotvoreniia i poemy Eleny Shvarts [Shorter and Longer Poems of Elena Shvarts], (St. Petersburg, 1999). In the spring of 1989 she was the single Soviet poet invited to the "Child of Europe" festival in London. Two books of her poems have appeared in translation: Paradise (Newcastle upon Tyne: Bloodaxe Books,1993) and Bin Kaltes Feuer brennt an den Knochen entlang (Berlin, 1997). Her work has also appeared in the following anthologies: Child of Europe: A New Anthology of East European Poetry, edited by Michael March (London: Penguin, 1990), Twentieth-Century Russian Poetry, edited by John Glad and Daniel Weissbort (Iowa City: University of Iowa Press, 1992), Contemporary Russian Poetry: A Bilingual Anthology, selected, with an Introduction, Translation, and Notes by Gerald Smith (Bloomington and Indianapolis: Indiana University Press, 1993), Third Wave: The New Russian Poetry, edited by Kent Johnson and Stephen M. Ashby (Ann Arbor: University of Michigan Press, 1992), In the Grip of Strange Thoughts: Russian Poetry in the New Era, ed. by J. Kates (Zephyr Press, 1999).